Quite a few experiments use indicators, so this is a good thing to know! A selection of household chemicals like vinegar, lemon juice, soap, washing soda, apple juice. Rub a small piece of red cabbage onto something scratchy like a nailfile, sandpaper, emery board or grater and put the bits into water. Or ask your parents to help you boil a small piece in some water, then cool it down. The liquid works as an indicator. It goes red in acids (vinegar, lemon juice), green in alkalis (soap, washing soda), stays the same if the chemical is neutral like water. Now test some household chemicals (only use things you know are safe to touch) Colourless chemicals are best, because you get better colour changes. Vinegar, fruit juices, sauces, sour sweets, fizzy drinks, TCP, vitamin C are likely to be acid. If you haven’t got distilled (white) vinegar at home you may have onions or gherkins pickled in vinegar. Ask your mum if you can pour a bit off. Cleaning products, soap, bicarbonate of soda, indigestion remedies are alkali. 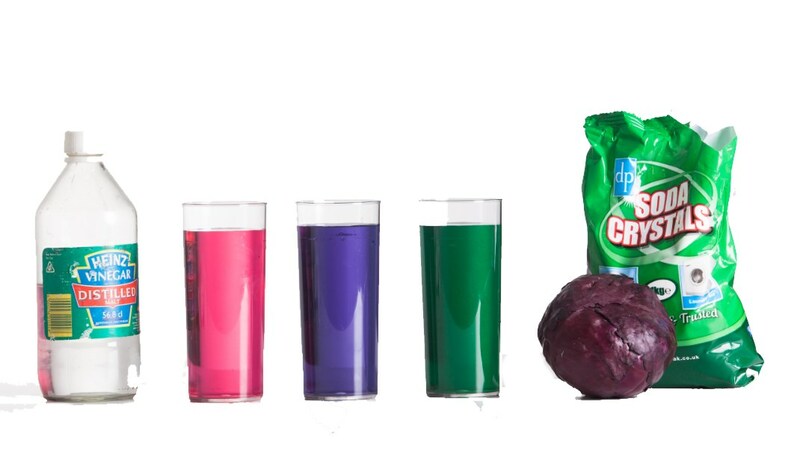 Many plants like red cabbage are sensitive to acids (anything that tastes sour) and alkalis (things that you clean with). This is one reason why acid rain is a problem.